The Griffin was not going to be a large and heavy model, like the Renoke. It was a smaller starship than the GCU Sokol and would be built to the same scale as that model, 1/350. I’ve had some success with these 1/4 20 female plugs that can be hammered into a pre-drilled piece of wood. So I went to the hardware store and purchased a 1 1/2 x 1 1/2 inch square piece of hobby wood and cut it to the width of the scanner section. 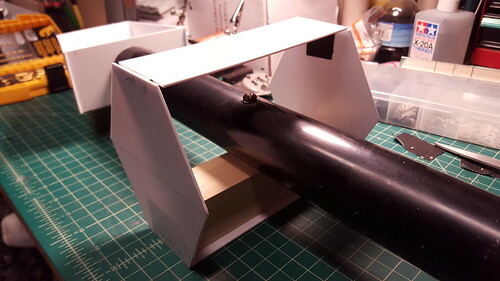 This would also be where I mounted the 1 1/2″ PVC pipe used for the Class-C engine. I drilled and hammered into the wood four of these plugs. 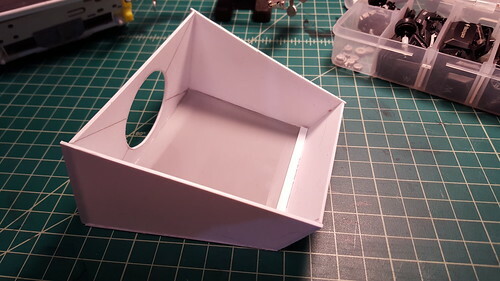 This would let me secure it to the PVC with the top one and give me left and right and bottom mounts for the model. Below we see the PVC and wood mounted with the scanner and head sections taped on for reference. 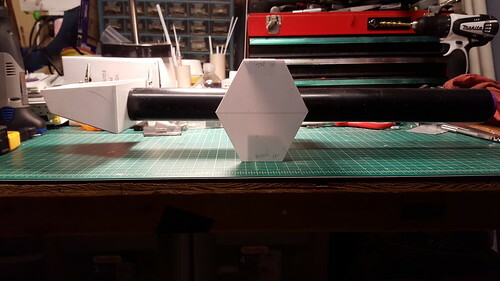 This is a side view of the model. Proportions are slightly long in this shot and would need to be shortened a bit to match my drawings. 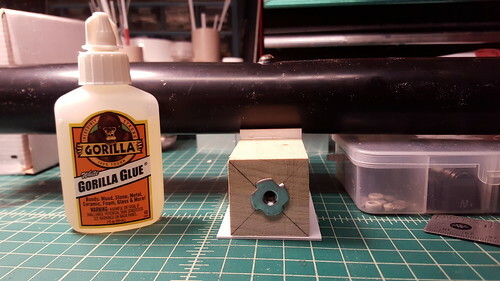 I’ve had great success gluing wood to plastic with this Gorilla White glue. The metal plug sticks out a bit so the plastic sheet on the bottom had to be removed so it set flush to the wood. 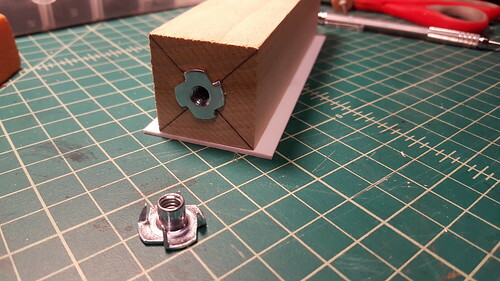 I also glued some strip plastic to prevent the PVC from twisting. I used 0.30 gray plastic sheet for the bottom of the head. I found a couple of parts from my bins that seemed to match the scanner gear under the head. So I went ahead and glued them onto the bottom. Normally I don’t do greebles until the boxing out is complete. 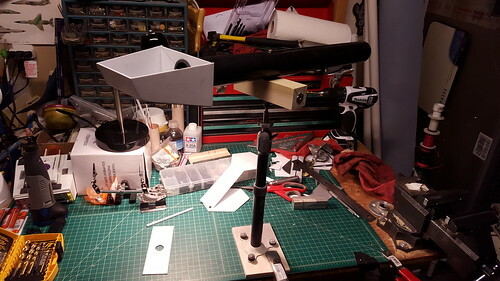 Here’s the model mounted on a stand. I’m always on the lookout for interesting details. 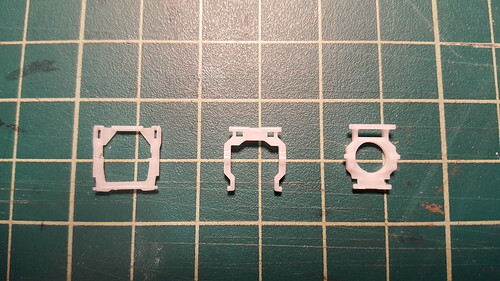 These white plastic parts are only a couple centimeters wide and come from inside the keys of a laptop computer. I thought the ones on the ends looked like they could be escape pods for the side of a starship. 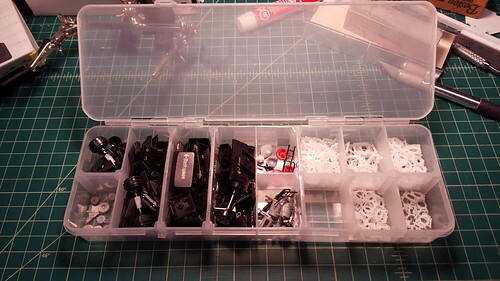 Here is a divider bin where I keep small parts. I’ve separated out the keyboard parts to make finding them easier. 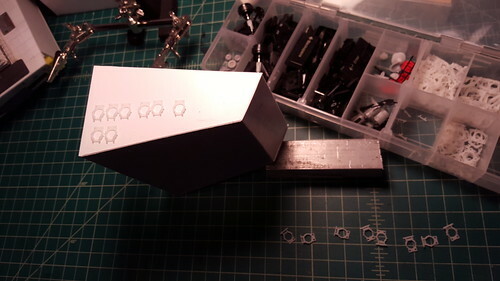 Below I’ve placed a row or two of these greebles along the side of the head to judge size and placement. I’ll definitely use them. Here is the head section of the ship after boxing it in. 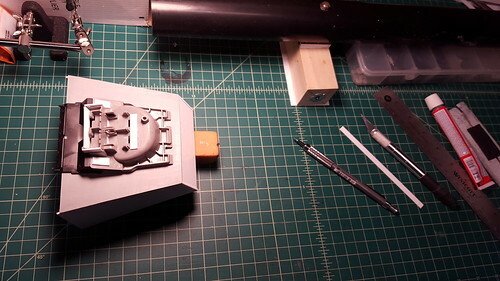 There will be more supports and I’ll have to figure out what to do with the fiber optics from the head. It’s a good bet the fibers will run through the PVC to the center scanner section where I’ll mount the LED light for them.